If you want your kilt made by an experienced American Kilt Maker, you’ve come to the right place. 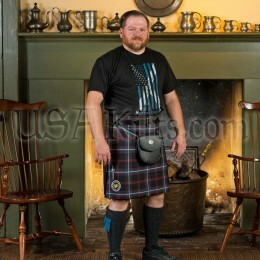 We are a US kilt maker by trade as well as conviction. Using the best practices and blending time-honored techniques of Scottish kilt makers with modern technology, we’ve been sewing Scottish kilts this side of the pond since 2003. Each of our kilt makers goes through a rigorous training apprenticeship to learn the craft. True to that craft, we do not make our kilts in an assembly line fashion. Rather, our kilt makers share a common workshop and share knowledge (and a few laughs) back and forth each day. Every kilt we make receives the same attention to detail. Your kilt will be assigned to one artisan whose signature will appear on the information sheet included in your order -- you’ll know exactly who made your kilt and the date they completed it! Great Kilt 13 - 16 oz. Is there a difference between our kilts and a Made in Scotland Kilt? About 3,000 miles... that's it. The kilt you get will be built to the highest quality standards and fit perfectly, just as if you bought a Scottish Kilt in Edinburgh, Glasgow or Inverness. The largest difference is that we're stateside, so you will get your kilt faster, at a competitive price for the quality, and we're easy to contact. We understand North American customers have a wide variety of uses for different types of kilts and highland wear fashion and we cater to them all. We stand by our quality, and we stand with you as a fellow kilt lover. We are proud to be the largest kilt maker in the USA, and we'd be honored to craft a kilt, made in the USA, just for you. 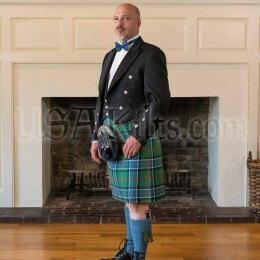 Whether you're going to a wear a kilt to a wedding or wear one every day, USA Kilts has the right men's kilt for you. Each custom kilt, whether casual or formal, is made to your precise measurements by a kilt maker right here in our Pennsylvania shop. If the measuring process or the number of options are a bit overwhelming, sit back, relax and watch the videos we've created to help educate customers on our different men's kilt models. As custom kilt makers, we are often asked about the history of the kilt and what counts as an authentic kilt. Some sort of kilt-type garment has been worn in Scotland for centuries. For most of history, kilts for men consisted of the Great Kilt (Gaelic: Feileadh Mòr), a long piece of cloth which was hand pleated and wrapped around the wearer. People still wear them for fun and some special occasions such as theme weddings, Renaissance fairs, LARP, SCA, historical reenactments, etc. Most of the kilts we are familiar with nowadays are modeled after the "short kilt" (or "little wrap", Gaelic: Feileadh beag) which originated in the late 18th century and was perfected by the Victorians in the 19th century. This is a more tailored piece of clothing -- the pleats are sewn in and the fabric is shaped, sewn and reinforced to make an attractive, form-fitting and durable garment which is fastened with leather straps and buckles. Originally, most short kilts used around five yards of wool tartan cloth in their construction. The Victorian era saw the full development of highland wear including the more impressive eight-yard kilt. 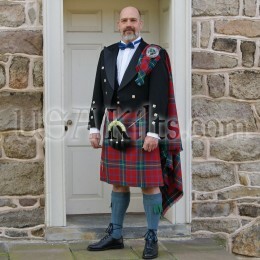 8-yard kilts are now quite standard, especially for formal highland dress or for bagpipe bands. Five yard kilts are still genuine kilts, just considered "day wear" or "casual wear" in Scotland. They are lighter and are quite easy to wear and more affordable even if they don't have quite the same "swing" as an eight-yard. You may be wondering about Irish kilts. Yes, the Irish wear kilts, but the tradition of doing so only dates back to about the turn of the 19th century when Irish nationalists promoted the idea. 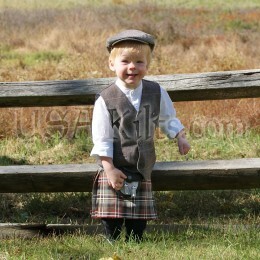 Similarly, the tradition of the kilt in Wales is very young, having started in the 1990s, but is growing fast. Anyone with pride in their Celtic heritage can wear a kilt. As can anyone who simply admires the kilt as a unique and handsome part of a man's wardrobe. 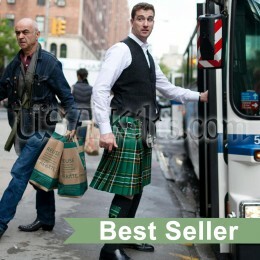 In fact, today many men wear wool kilts or PV kilts (polyviscose fabric) kilts just for fun. A typical sport kilt, such as our Casual Kilt or our Semi-traditional kilt, can be a great option for festivals, highland games, concerts, or any night on the town. A good quality kilt, whether it is a premier kilt or a more sporty kilt, is as much a part of your life as you want it to be. There's nothing like the feel and fun of a real kilt!